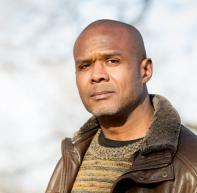 James Hannaham is the author of the novels Delicious Foods (Little, Brown 2015), a New York Times and Washington Post Notable Book of 2015, winner of the PEN/Faulkner Award, and God Says No (McSweeney’s 2009), and has published stories in One Story, Fence, Story Quarterly, BOMB, and one in Gigantic for which he won a Pushcart Prize. He has exhibited text-based visual art at The Center for Emerging Visual Artists, 490 Atlantic, Kimberly-Klark Gallery, and James Cohan. He teaches in the Writing MFA program at the Pratt Institute. This interview was conducted via email by Interview Editor Audrey Hawkes. Of the process she said, “This book and interview were both incredibly eye-opening for me. James sheds light on a subject that often isn’t discussed, or even acknowledged. I feel lucky to have had the opportunity.” In this interview, James discusses his influences, his motivation to write, and the dark truth of modern slavery. Superstition Review: Delicious Foods plays with narration, even giving crack cocaine a narrative voice. What was your process for writing these different perspectives? At what point in the composition of the book did crack cocaine become its own character? James Hannaham: It happened more or less accidentally, a result of trying different things. I started writing a voice that I thought would be able to tell Darlene's story in the 3rd person, because it did not feel honest to tell the story of a drug user in 1st person and give the voice great recall and insight that a user wouldn't have had at the time. The voice was vernacular and street and funny and fun to write. And then I changed Darlene's socioeconomic background because I wanted to emphasize that she was someone who had had some opportunities. But I had really been enjoying writing that other voice, and I wanted an excuse to write that way. So at one point I asked myself, if this isn't Darlene, then who is this narrator? And one of the answers that came to me was that it was the drug itself. Which seemed just audacious enough to be the right choice. SR: How did writing Delicious Foods compare to writing your first novel, God Says No? Both deal with topics that are often difficult to discuss (like homophobia and addiction). Did you find one book easier to write than the other? JH: They each presented different challenges. I enjoy writing about topics that are difficult to discuss, so that was the least of my problems. I actually think that's part of the reason to write literature, to give people the opportunity to delve deeply into the emotional terrain of difficult topics. Writing ought to be pleasurable on some level at all times. If you aren't engaged with the writing, it's silly to expect anyone else to get excited about reading what you've written. So neither of them was "easier," than the other, exactly. But with a first novel you always know why you're writing it—because you want to publish a novel! The reasons to write a second novel are a little less clear. To prove that you can do it again? To see if you can have a career? Because there are things that you left unfinished or unsaid in the first book? Because you got a two-book deal and you are obligated to do it? Just for the heck of it? Because you've ruined your life by spending so much time writing the first one and nobody will hire you to do anything else? Because you are not good at anything else? SR: Did you aim to make a political statement when you started writing Delicious Foods? What drew you to tell this story in particular? JH: Yes, but "aim" isn't exactly the right sense in which I set out to do it. I knew that the subject matter was full of hot-button issues, but for me it isn't so interesting to start out with a preconceived political agenda and turn a novel into a polemic. I just wanted to tell a human story in the middle of all of those hot-button issues. The subject matter would be inherently political; I just trusted myself not to betray my own political beliefs as I wrote the book. And my statement is ultimately more humanitarian than strictly political, that slavery hasn't really disappeared, it has just morphed into something similar and largely illegal whose truth we don't want to face because it affects us in ways that we may have difficulty trying to change—do we know whether the clothes we're wearing have been sewn together by slaves? Would we still wear them if we knew? Did that shrimp we're eating come from a slave crew in Thailand? We often don't know. So if it's political to say that it's fucked up that we don't know any of this, I suppose that is the statement I meant to make. SR: How did you come up with the idea for the Delicious Foods farm itself? What helped you develop that space? JH: Oh dear. This question suggests to me that you didn't realize that there are a number of real-life cases of modern slavery in which corrupt farms sent out vans to coerce people from urban areas to come with them far away and then placed them in indentured servitude or slavery and sometimes paid them in drugs. And that once you find out about this kind of scam, you'll notice that it's everywhere. I just saw a documentary on Al-Jazeera about these Indian men who were told they'd be paid a decent wage in the mess halls of the US Army in Afghanistan, and it turned out to be a much worse situation than they'd been led to believe. SR: Delicious Foods begins with Eddie being an adult, a long time after the main events of the rest of the novel, and then moves back in time to Eddie’s childhood. Why did you choose to start the story this way? JH: There are a number of reasons. 1. It's a pretty dramatic start to the story but it still leaves a lot of questions about what has taken place; 2. The book is to a large degree about labor, and the loss of his hands is really meant to have a great deal of symbolic weight in addition to the gruesomeness;3. I wanted to tell the story of a remarkable person of color who had overcome a lot of odds and have the story be about him, and not the way he changes some white person's life; 4. I knew I was going to tell the story out of sequence and it seemed like a good place to start; 5. It is on some level useful to know that despite the horror you're about to read about, someone does manage to get through. The book does a lot of that, actually, telling you what's going to happen before you read about how. Which is deliberate. SR: You’ve said before that one of the reasons you wrote this novel is because you wanted to give the kind of character who is usually just a side character, like Eddie the Handyman Without Hands, their own fleshed out story. Who are some of your favorite side characters you wish could have their own stories? JH: That's funny; the second half of my MFA thesis was a retelling of Casablanca from the perspective of Ilsa and Victor Laszlo. I had to watch Casablanca for a film class and I realized that I was kind of falling in love with Victor Laszlo though I knew that wasn't how the movie was supposed to work. He's the moral center of the movie, his past is full of really astounding, honorable deeds, he's a writer who has gotten in trouble for speaking out against the Third Reich, but the rakish, indolent Rick (Bogart) is the guy you're supposed to identify with? No thanks. The film makes Victor come off as aloof and stiff and even a tad fey with his champagne cocktails and whatnot. But those things didn't deter me at all. SR: I’m always fascinated with stories where a young character is placed in a difficult or dangerous situation beyond their years. What was it like writing Eddie’s chapters? Were you ever worried about how you portrayed his age? JH: Yes. At a certain point in the editing process, I raised his age by two years just because he was starting to sound sort of unbelievably precocious. SR: Were you inspired by any other authors or books while writing Delicious Foods? Who are some of your literary influences? JH: Firstly, this book is the demon child of a nonfiction book, Nobodies by John Bowe, and I always keep a bibliography going while I work. Among the titles that I can say were most usefulwere probably Faulkner's As I Lay Dying and Light in August, Toni Morrison's Beloved, Ishmael Reed's Mumbo Jumbo and Flight to Canada, Patricia Smith's Blood Dazzler, The Grapes of Wrath, George W. Cable's The Grandissimes, and a slew of nonfiction books including To Plead Our Own Cause, A Crime So Monstrous, Disposable People, The Slave Next Door, a 2-volume set of slave narratives edited by Yuval Taylor called I Was Born a Slave, Crackhouse by Terry Williams—I could go on. A lot of what I read can end up in whatever I'm writing. I used a question from Pablo Neruda's The Book of Questions to build part of a scene in the first chapter: "Who does a watermelon laugh at when you kill it?" SR: Not only are you an author, you’re a visual artist as well. What non-literary works inspire you when you’re creating a piece, either visual or written? JH: Funny you should ask that w/r/t Delicious Foods. My cousin is a well-known visual artist, Kara Walker. Which is how I convinced her to do the cover illustration. I consider DF to be in conversation with a lot of the work that Kara's done over the many years I have known and adored her and spent time contemplating her work and its impact. There are also a lot of family in-jokes embedded in the book. I dedicated the book to her, and to my bestie Clarinda Mac Low, who is a multimedia artist and something of an artistic community organizer. JH: I have a lot of different places I go to write. I have an office at home where I do a lot of stuff that requires the Internet, and then I have a space where I make art and sometimes write. That place is kind of a mess. I've been working with vinyl lettering and there are a number of long sentences in vinyl lettering wrapped around the walls and windows. I sometimes write while lying on the floor or in bed at home. I have gone to a lot of artists' residencies. I can sometimes write in cafés, but usually I don't.